Last year’s record heat was fueled by a combination of the effects of global warming and one of the strongest El Niño events on record since at least 1950, NOAA said. Greenhouse gases highest on record. Major greenhouse gas concentrations, including carbon dioxide (CO2), methane and nitrous oxide, rose to new record high values during 2015. The annual average atmospheric CO2 concentration at Mauna Loa, Hawaii, the location of the world’s longest direct measurements of CO2, was 400.8 parts per million (ppm), which surpassed 400 ppm for the first time. This was 3.1 ppm more than 2014, and was the largest annual increase observed in the 58-year record. The 2015 average global CO2 concentration was not far below, at 399.4 ppm, an increase of 2.2 ppm compared with 2014. 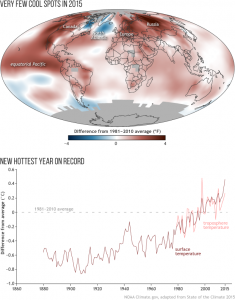 Global surface temperature highest on record. 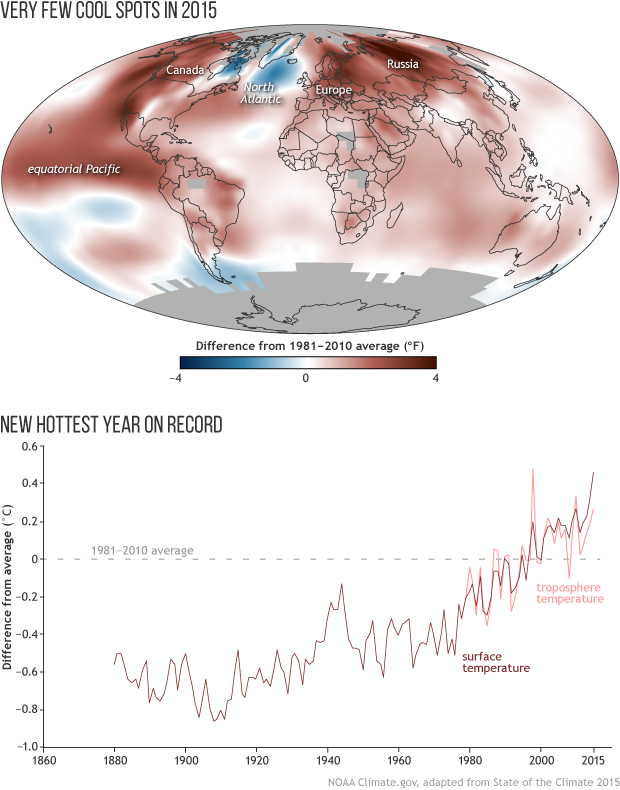 Aided by the strong El Niño, the 2015 annual global surface temperature hit record warmth for the second consecutive year, easily surpassing the previous record set in 2014 by more than 0.1°C (0.2°F). This exceeded the average for the mid- to late 19th century — commonly considered representative of preindustrial conditions — by more than 1°C (1.8°F) for the first time. Across land surfaces, record to near-record warmth was reported across every inhabited continent. Sea surface temperatures highest on record. The globally averaged sea surface temperature was also the highest on record, breaking the previous mark set in 2014. The highest temperature departures from average occurred in part of the northeast Pacific, continuing anomalous warmth there since 2013, and in part of the eastern equatorial Pacific, reflective of the dominant El Niño. The North Atlantic southeast of Greenland remained colder than average and was colder than 2014. Global upper ocean heat content highest on record. Globally, upper ocean heat content exceeded the record set in 2014, reflecting the continuing accumulation of thermal energy in the upper layer of the oceans. Oceans absorb over 90 percent of Earth’s excess heat from global warming. Global sea level highest on record. Global average sea level rose to a new record high in 2015 and was about 70 mm (about 2¾ inches) higher than the 1993 average, the year that marks the beginning of the satellite altimeter record. Over the past two decades, sea level has increased at an average rate of 3.3 mm (about 0.15 inch) per year, with the highest rates of increase in the western Pacific and Indian Oceans. Extremes were observed in the water cycle and precipitation. A general increase in the water cycle, combined with the strong El Niño, enhanced precipitation variability around the world. An above-normal rainy season led to major floods in many parts of the world. But globally, areas in “severe” drought rose from 8 percent in 2014 to 14 percent in 2015. Meanwhile, the Arctic continues to lose sea ice, impacting marine life by forcing walruses to shore and sending fish populations out of the region; harmful algal blooms spread in the northeast Pacific; and tropical cyclones worldwide were well above average, NOAA said. 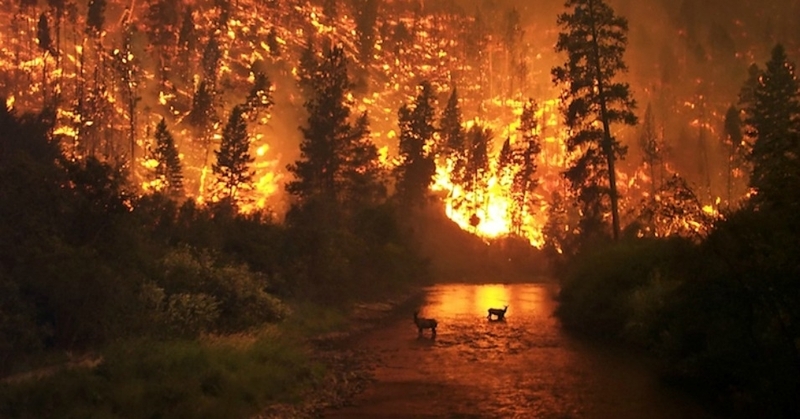 The report is released amid a rash of climate-related nightmares taking place around the world. In Maryland, historic rainfall killed multiple people this week; in Siberia, melting permafrost released long-dormant deadly anthrax into the air, sickening several people and killing thousands of reindeer; in the Middle East last week, scorching temperatures smashed historic heat records for the Eastern Hemisphere.